Editor’s Note: Stephen Gencarella, the author of ‘Wicked, Weird & Wily Yankees’ will be the guest speaker at the Lyme Public Library’s Annual Meeting on Tuesday, June 26, at 7 p.m.
What a pleasure: to read an engaging book by a close neighbor (Steve and his family live just down Tinker Lane from me) and to encourage other Lymies to do the same! Steve, a professor at the University of Massachusetts in Amherst and the resident folklorist at the Connecticut River Museum, offers us a series of essays about unusual folk from New England, eccentric and out-of-the-ordinary men and women: hermits, healers, poets, mesmerists, fortune-tellers, prophets, reformers, bandits, visionaries, vagabonds, introverts, and misogynists. In other words, most of us! Among the locals described in these essays are a character at the Monkey Farm Café in Old Saybrook, William Gillette of Gillette’s Castle, that “Hadlyme stone heap,” and Elizabeth Tashjian, perhaps better known as “The Nut Lady” of Old Lyme. But I was most impressed by the author’s continued use of the word “passing” as his euphemism for death: he uses it 31 times, by my count. It reminded me of that famous “Dead Parrot” skit from Monty Python, in which John Cleese presents an inert parrot nailed to a stick to Michael Palin, the man who had just sold it to him. 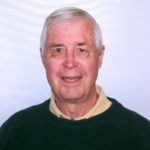 Does this usage “passeth all understanding” (Philippians)? I pass … but do read these entrancing stories of eccentric Yankees! 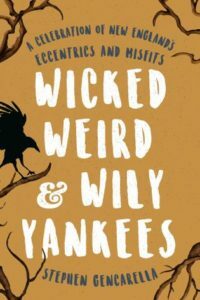 About this book: ‘Wicked, Weird & Wily Yankees’ by Stephen Gencarella was published in May 2018 by Globe Pequot, Guilford, CT 2018.